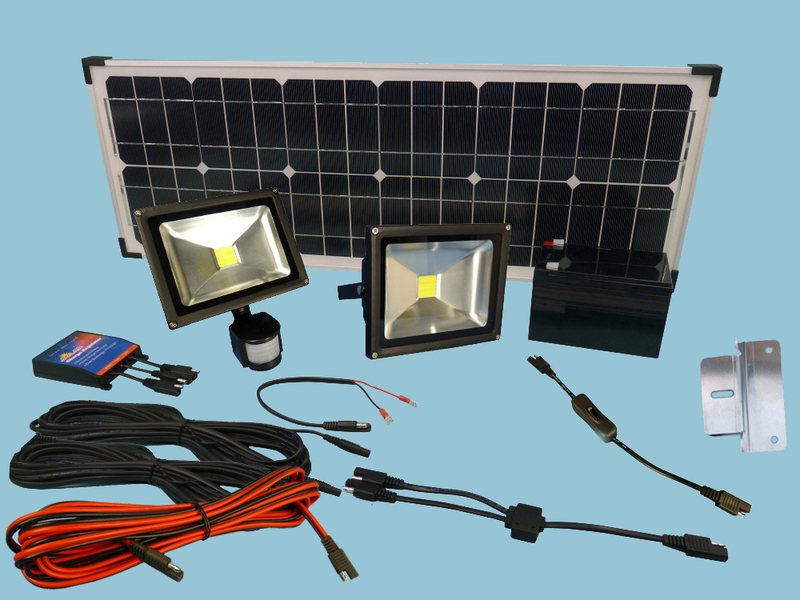 Our Solar fastFIX Floodlight Kit is ideal for providing effective low energy lighting to all types of outbuildings with no mains power such as garages, stables & barns. Lighting is provided by two 10W LED floodlights, one with a PIR so there is no stumbling around in the dark when you approach the building and another standard 10W LED floodlight that can be switched on when you arrive this LED Floodlight will easily give you lighting for a double garage. Our Solar Floodlight Kit uses fastFIX cables and connectors, everything is pre-wired for a qick and easy installation. Both Floodlights are IP65 rated so they can be mounted internally or externally to suit your requirements. One of our Sunshine fastFIX Solar Panels and solar charge regulator will ensure the 12V battery supplied with the kit is replenished during daylight hours with the power of the sun, saving money and at the same time providing a perfect external/internal lighting solution.